We've been craving some warm sunshine here in the Midwest, so what a perfect color inspiration this photograph is for this week! I found this wonderful inspiration called Sunshine Yellow Color Pallette from The Sweetest Occasion. The colors of these vintage clutches remind me of So Saffron, Going Gray, Chocolate Chip, Very Vanilla, and More Mustard. To join us in the Curtain Call Color Challenge: Act 17, simply create a papercrafted project using these colors (or similar shades), post it on your blog or other public gallery (Splitcoaststampers, Paper Craft Planet, Stampin' Addicts, etc.) using the keywords Curtain Call, link your posting back here to the Stamping Stage, and then come back to enter your name and the exact link to your project in the Mr. Linky box. 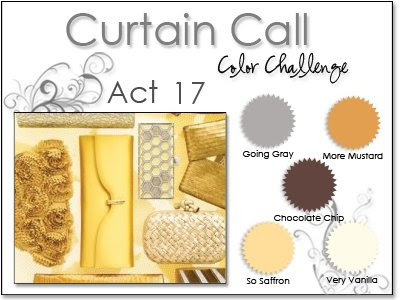 You have until Saturday, February 20th before midnight (CST) to enter your Curtain Call Color Challenge: Act 17 project. 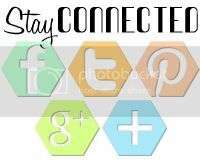 Those who are chosen as Show Stoppers will be awarded this badge to post on their blog and share the exciting news! I will be picking more than one Show Stopper for every ten Curtain Call Color Challenge submissions! I went a little crazy with the color spritzer...spritzed a little to much, I think! Anyway, I love the layout of the card that I found in the new Paper Crafts magazine...wow, there's some great inspiration in there! Have any of you ever sent a card to Paper Crafts for a contest before? Oooh, what a fun colour combo. Hope to be able to play again this week. the Olympics are taking first seat to most things since we are the host city and I'm an Olympic junkie so hopefully, I can sneak this in sometime. Great sample card. I sent you my e-mail. Let me know if you didn't get it and I'll post it in a comment here. I LOVE these colors!! Can't wait to play! OMG - these colors are drop dead fab!!! I love them....my girls are off this week so I know I'll play!!! Beautiful card and great colours! Stacey - thanks so much for stopping by my blog and leaving your sweet comment! I'm happy you did because I came to yours and WOW! I love every card on here! Seriously, this one is STUNNING, as well as so many more. I'll be back for more, that's for sure! you have set the bar high with your card this week, I love the spritzing, may need to put that on my wish list!! I do not have a blog but I uploaded my card to my gallery at SCS. Thanks for the fun!! SO pretty!!! 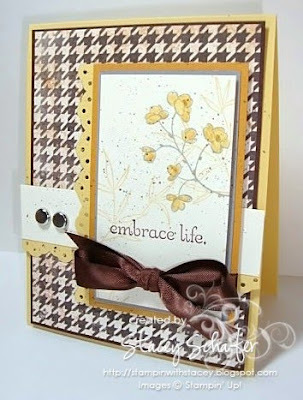 And it is funny that you ask....I submitted a card for the World Cardmaking Day contest.....and won! My card is in this month's issue! Of course I don't actually have a copy of the magazine yet......I've only heard from others that it is in there! LOL! Hope you don't mind but I decided to try a second card, a more manly card card with your color selection. Having a fun week here in Virginia. Stacey, thank you for your nice comment about my entry. Did I not do everything I was supposed to do to link it? I'm pretty new to the "challenge thing" and maybe I missed something??? Please advise! Stacey...these colors were harder then I thought...LOL....but I had fun playing!!! 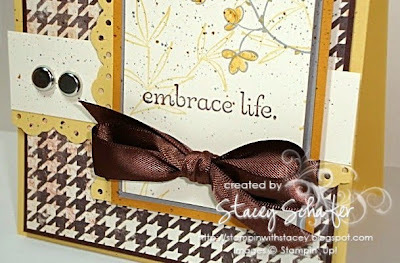 This is a gorgeous color combination and the cards folks are creating are just beautiful!! What fun colors Stacey! I enjoyed working with them this week, as usual! Thanks! ughh - i missed it! I loved your colors, Stacey... don't know how I ran out of time this week... heck I may just play this one anyway tomorrow! Hope you're having a great weekend! I missed the deadline. I've been sick all week and haven't stamped much. But I love this color combo and hope to use it soon! I'll post when I do. Better late than never, right?